Many travel concerns are identical whether or not you're crossing international borders. I'll start with those and then go on to specifically international issues. Your laptop could be stolen at the airport, in your hotel, or when you're walking down a street. A few precautions should provide protection. Carry it in a case that doesn't look like a laptop case. There's no reason to walk around visually screaming "I've got expensive equipment here!" When you're in public, always keep an eye or a hand on that case. No one should be able to touch it without you knowing it. If you're going to leave the laptop in your hotel, secure it. If there's a safe in your room, use that. If not, ask if it can be locked in the hotel safe. Or bring a secure laptop cable. Both Kensington and SecurityKit.com make them. If someone threatens you with violence, give them your laptop. It's not worth your life. 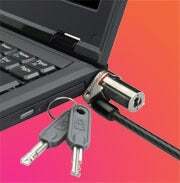 If your laptop is stolen, you don't want to lose more than the hardware. Protect all of your data by backing it up, and further protect your sensitive data by encrypting it. I recommend TrueCrypt for encrypting your sensitive files. It's free, simple to use, and pretty-near unbreakable. At least it is if you use a strong password. If you're traveling outside of the country, you will have to go through customs at least twice. And custom officials may have the right to examine the contents of your hard drive. You should therefore delete anything that might get you into trouble. Sure, you could encrypt the problematic files. But if the customs officer asks if you have anything is hidden on the drive, you're safest if you can tell the truth. You'll want to recharge your laptop on the trip, so you'll have to think about electricity. 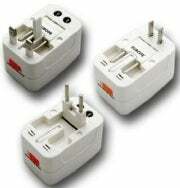 AC power plugs and voltages vary from country to country. Voltage shouldn't be a big problem. Every laptop power adapter I've examined in the last decade can handle voltages from 100-240v. Examine the tiny text on your power brick to make sure it can handle that range. But you will need an adapter for the plug. These are easy to find and often cost less than $10. Just use your favorite search engine to look for ac plug adapter and the name of the country.